The first Collaboration café last night was a great success, and I woke this morning full of new ideas and enthusiasm... due to the good company, wise choice for once of (organic ginger) beer, and inspiration from guest George Por. 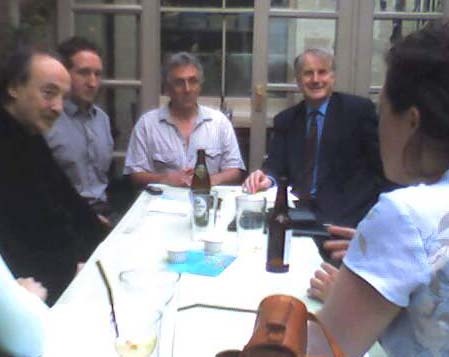 The café location was the patio of the Duke of Cambridge pub, Islington, showing how little organisation is needed .... beyond, of course, the networking skills of Chris Macrae. George promotes the idea and realisation of collective intelligence, which you can read about in detail on the CI blog. There's more here about George, who lives in Amsterdam, and is also a visiting researcher at the London School of Economics. On that web site George answers the question "What is an underlying question that gives form to your work or interest in this field (collective wisdom)?... with the answer: "How best to facilitate the emergence of evolutionary consciousness in organizations and communities, as a guidance system shaped by networks of connected conversations about questions that matter." That may sound a little abstract and guru-like, but George ("please don't call me an expert") isn't like that at all. He suggested we split our time together into two, spending the first part on reflection and discussion about the experience of being there. This checked the usual 'and what do you do' questions around the group, which can be a little intimidating even in the friendliest of new company as you try to work out how to present your self, rather than be present. By the second part we were able to move from ideas of being to those of doing with a sense of calm, equality, and good cheer which might not yet have been collective wisdom but was moving in the right direction. One of the challenges George offered us for discussion was how we might each wish to increase the effectiveness of what we do tenfold - not necessarily by additional skills and resources, though those could help, but by the way we go about things. George explained that it was a challenge he had set himself for the next year, but as a facilitator he could only achieve it with our help. If he helped us achieve more, he would meet his goal. In that spirit he offered, for free, to provide us with support and mentoring - subject to some explicit commitments on our own part. It seems like a wonderful deal, and of course a terrific way for a facilitator or anyone else to learn from a widening circle of interesting people. Serious networking, and I know my good spirits this morning came from the energy George helped to release. Instead of thinking too much of the time about what I 'should' do, I can reflect on what I can offer others knowing that benefits will flow in return. There's even a business plan in there somewhere. D*mn, jealous I couldn't be there. Have to look George up in Amsterdam one of these days! And all those other names that ring bells. I am glad to see that in recent times a lot of these get togethers are getting of the ground in different shapes and forms....are we witnessing the mycelium of our networks becoming visible and transforming into viable structures for action? "are we witnessing the mycelium of our networks becoming visible and transforming into viable structures for action?" Yes and no. Yes to the "becoming visible" part of the question, thanx to what the smart combination of blogs, wikis, RSS and live meetings will make possible. I put it in future tense because we're still at the first baby steps of it.